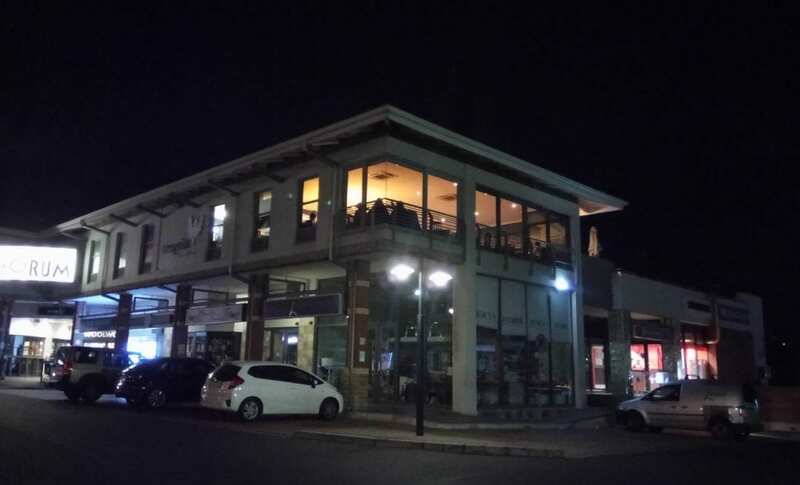 It’s not often that you accidentally stumble across a restaurant you’ve been wanting to visit for ages – but my boyfriend and I recently experienced this while out on a late night PnP shop in Welgemoed Forum. From the ground-floor parking lot, we distantly saw what looked like a very elegant and chic restaurant and, after squinting into the fading light, I eventually realised it was Arugula: a place I had heard good things about for over a year. A few days later, my boyfriend had successfully secured a reservation for us. The result of this was that we enjoyed a wonderful, intimate evening together at Arugula. It was a particularly great discovery in the end because we not only celebrated a special occasion here, but it also felt like a welcoming to pretty Welgemoed, especially with our being new to the area. Arugula Bistro & Bread was born out of a desire to create a family fine dining establishment. 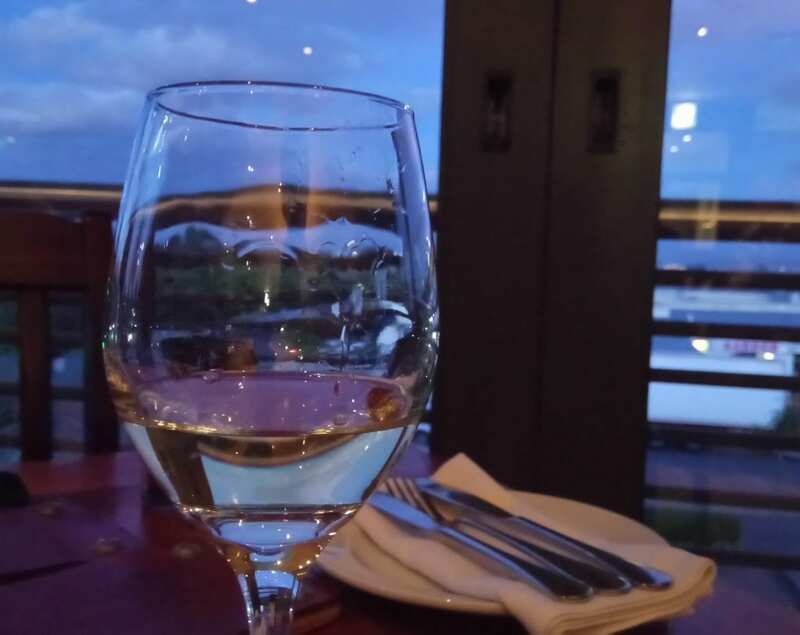 And if popular local word of mouth is anything to go by, it seems like – since its opening in 2012 – it has been consistently achieving its mission of ensuring: “good wine, good food and good people to enjoy it with”. Inside, Arugula’s chic interiors are lovely and polished, with leather chairs and smooth, dark wooden tables throughout. The lighting at night is also soft, adding a lovely, intimate feel. In fact, it almost replicates a romantic candlelit dinner. In the evening especially, Arugula is perfect for enjoying a romantic dinner or sharing a meal with a group of friends. Just beyond the main entrance, there is also outside seating to choose from. Sometimes at night, people choose to sit here too but on the night of our visit, it was a bit too nippy so the doors remained close against the bracing cold. (You can also enter through the sneaky exit, climbing the stairs up from the ground floor near Woolworths Food). The outdoor tables overlook the roof parking, another handy feature about its location. Most people seemed to park here but you can also park in the main Welgemoed Forum parking, as we did. 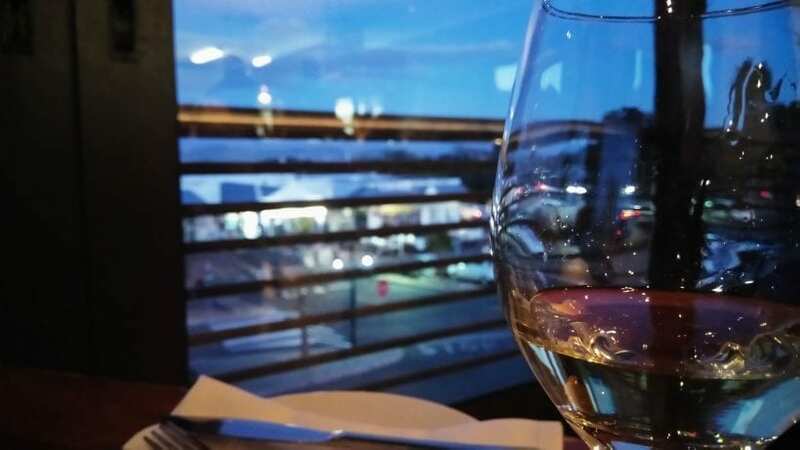 For me, the steady, contented flow of dinnertime conversation is always a good indicator of a popular restaurant – and one which has also successfully achieved a welcoming ambiance. Arugula feels comfortable and cosy, but the impressive views from the oh-so-close-by open kitchen and expansive wall-to-floor windows really steal the show. It allows you the chance to soak up not only the buzzing atmosphere, but also the beauty of twinkling city lights and distant farmlands. And you can do all this from the comfort of your plush seat, in the quiet suburb of Welgemoed… it’s pretty hard to beat, let me tell you! The menu offers breakfast through to dinner and, although Arugula is quite meat-focussed, you will find something here to satisfy every palate. There is also a nice kids’ menu, available only to children under 13. 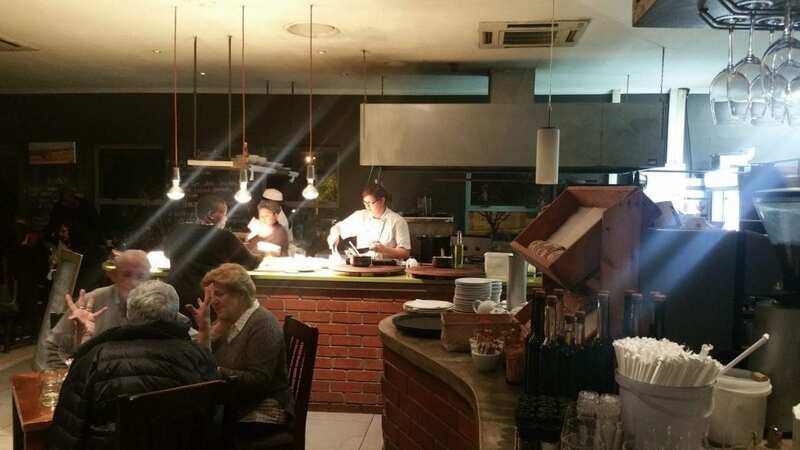 Their team of efficient staff are friendly and ensure you aren’t left wanting for anything, even when this small, busy space is bursting at the seams – like it was on the night of our visit when there wasn’t a table free for longer than five minutes at any given time. Our food was brought to us with speedy efficiency, as chef Anouchka Horn and her kitchen team worked together, with quiet calculation and professionalism, from the open kitchen. I kept turning in my seat to watch them at work. 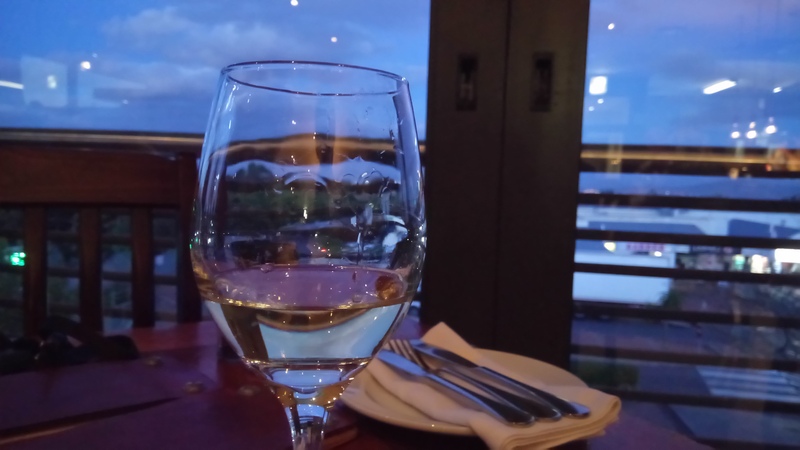 Although, with our window-fronting table, we could also watch their reflections through the window… something I was subtly doing every now and then. A solid wine display, mounted against the back wall, boasts some stellar wines and the coffee – provided by Origin, one of my personal favourites – is tops too. There is a selection of all kinds of cold and hot beverages though, so you’re not short on options. 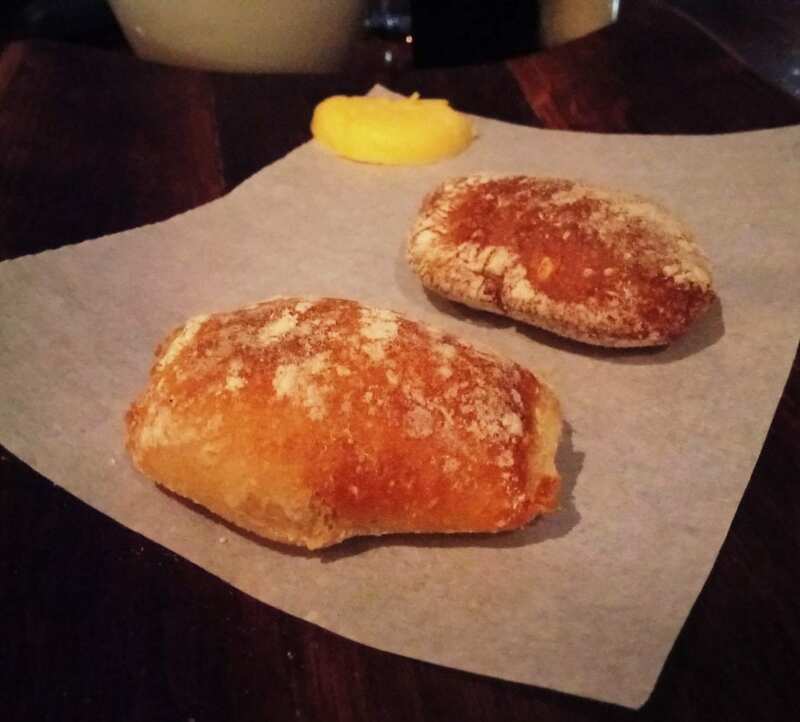 As a starter, we shared an adorable, complimentary mini bread ‘loaf’ each. 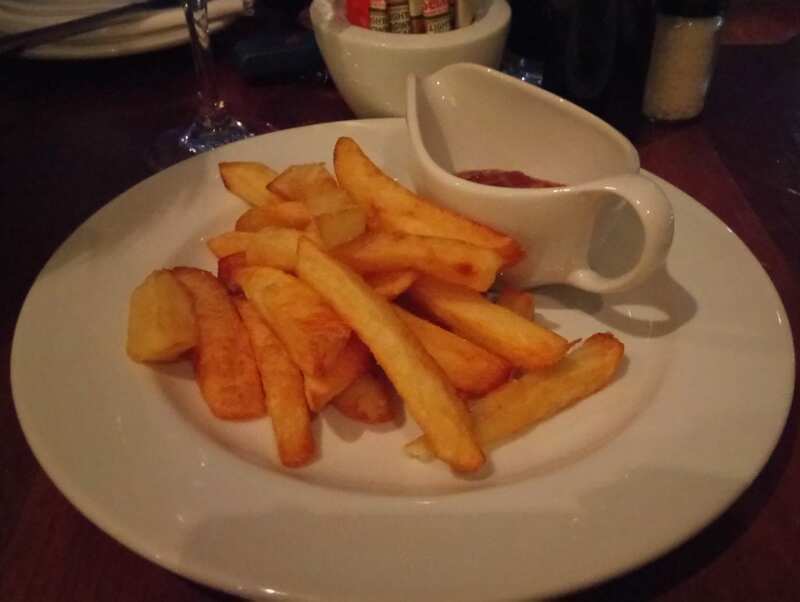 We also ordered a side of thick cut homemade potato chips (R25). These were arguably the best I’ve had – they were perfect! They came with a delicious, yummy chilli chutney that I also couldn’t get enough of. For drinks, my boyfriend opted for a Origin Flat White (R25), while I had the sweet Pierre Jordaan Ratatafia dessert wine (R25); this was similar to a white muscadel so I loved it! As a side note: with every course, our cutlery was changed. This is something I’ve only encountered previously in rather posh establishments. 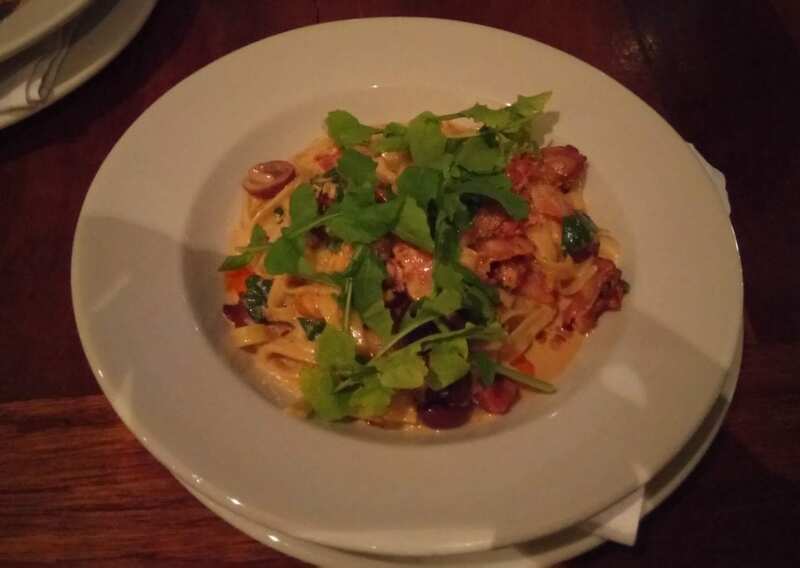 For our mains, we both opted for the Creamy Bacon and Sriracha fettuccini (R129). It also came with rocket, olives, spinach and roasted peppers. 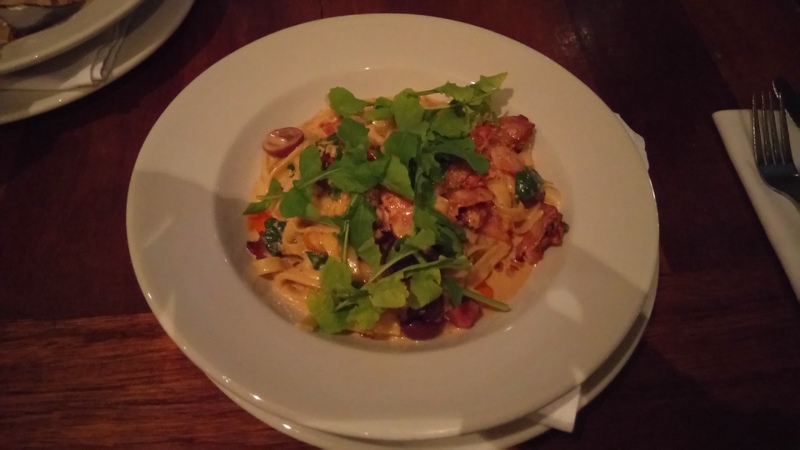 This was absolutely divine – it was warm, creamy and flavourful! They were very generous with the bacon… Usually, at most restaurants when I order a bacon pasta dish, I almost feel like hunting about for my bacon with a magnifying glass! All round, this was one of the most sublime dishes I have had in a long time. The flavours and ingredients were perfectly harmonised. Desserts and specials are listed on the blackboard-style walls, so don’t ask for a separate dessert menu. For dessert, we both ordered the sticky toffee pudding, which was served with ice-cream and an interesting vodka custard. It was warm, gooey and sweet, so, again, it was absolutely delicious, and very tastefully plated! I rated my dessert 10/10, while my boyfriend awarded his a very high (especially for him) 9/10. 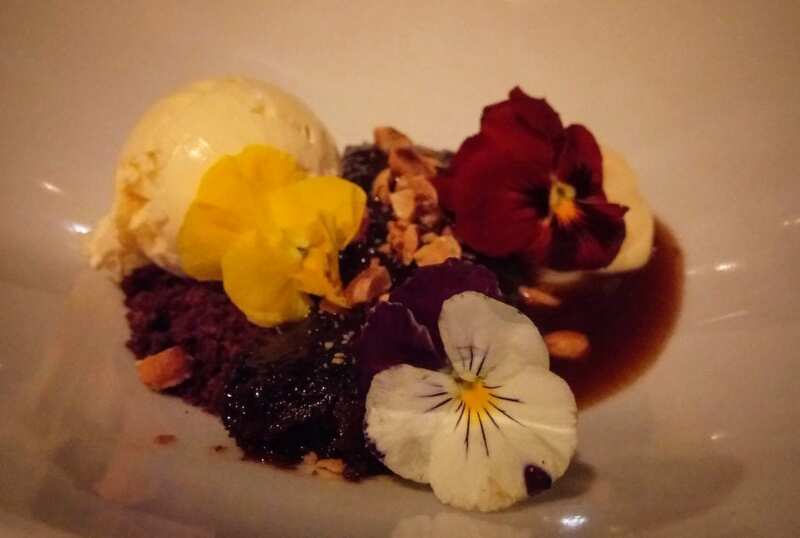 It really is one of the best desserts I’ve ever had when dining out – and Arugula’s ice-cream is sublime too. I was a bit disappointed not to see Neil Swart in action on the night, as his food passion on their website is both touchingly humourous and infectious… But I will be back to Arugula so hopefully I’ll get lucky next time! I am also eagerly awaiting the opening of their next venture: Belly of the beast. Something of an extension of Arugula, this 20-seater restaurant will offer daily food and wine pairings. Interestingly, it is set to be uniquely crowd-funded establishment. If you want to get involved in helping to bring it to life, you can buy a reward and help launch Belly of the beast. 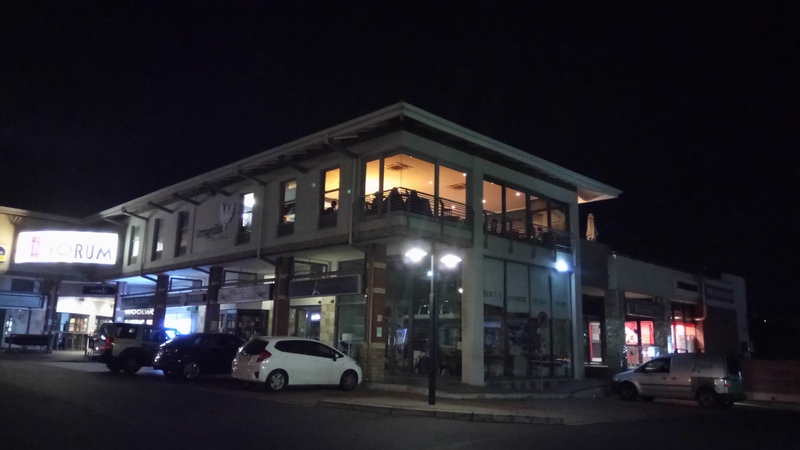 With drinks and the tip, our meal came to about R530 – but it was worth every penny. I thought it was reasonably priced too, especially for the quality of food and beautiful setting… Big ups, Arugula. Big ups! For more information on Arugula Bistro & Bread, you can visit their polished website. 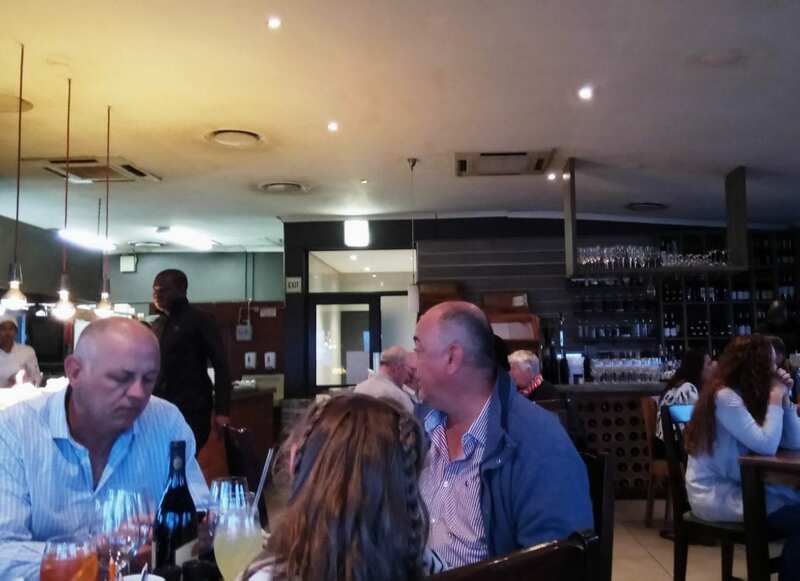 Or, contact them on (021) 913 6906 or email them at info@arugulabistro.co.za. 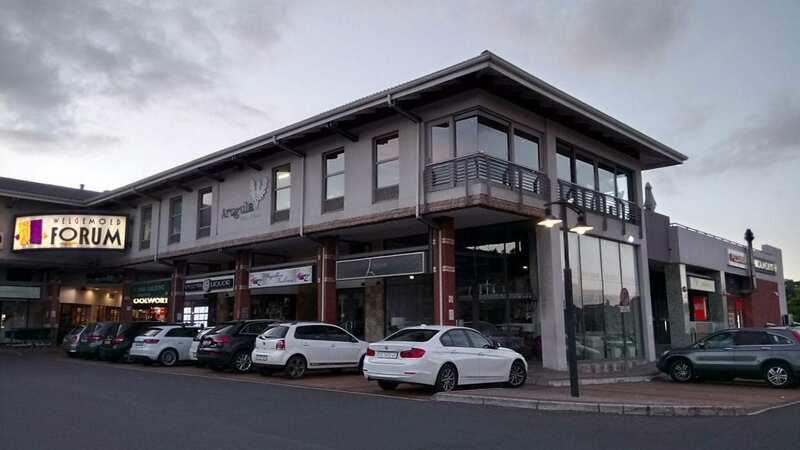 Or, as I strongly recommend, you can also visit them for yourself at: Shop 18, Welgemoed Forum, Welgemoed, Cape Town. Update: Arugula has since changed hands – but I feel it stays true to Neil Swart and Anouchka Horn’s vision (just with a slightly new spin and fresh look). They have since successfully gone on to launch Belly of the Beast, which is making ripples in the foodie scene.